I love a good "Reese's moment" (You got peanut butter in my chocolate!). I had one the other day, watching a story on Good Morning, Japan about how, in these uncertain times, businessmen were turning for inspiration to the classics. Such as Nietzsche (!). Or rather, books explaining Nietzsche. The professional explainer is a revered occupation in Japan. Like the grandpa in The Princess Bride, a good explainer sums up the important stuff, provides simple examples, and smooths over the big words and archaic syntax. A comparison that springs to mind is the "Books That Changed the World" series (such as On The Wealth of Nations by P. J. O'Rourke). Except more popular. Professional explainers like cognitive neuroscientist Ken'ichiro Mogi sometimes seems as ubiquitous as Oprah. Discussing other unique and not-boring books about business, they mentioned one with the title: 「もし高校野球の女子マネージャーがドラッカーの『マネジメント』を読んだら」 or "What if the Girl Manager of a High School Baseball Team read Drucker's Management?" written by Natsumi Iwasaki. That strange juxtaposition got my attention. The next day, Today's Close Up (NHK's version of Nightline) was about Peter Drucker's influence on business culture in Japan. Like Edward Deming, Peter Drucker has found more honor in Japan than in his home country. 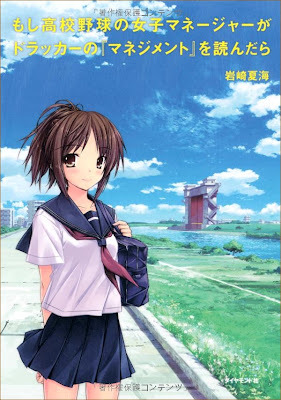 Featured was an interview with the author of the aforementioned book, Natsumi Iwasaki (岩崎夏海). He said that he'd gotten interested in the subject observing the difficulties players in MMOGs like Final Fantasy encountered organizing and managing teams. "What if the girl manager of a high school baseball team read Peter Drucker's Management?" (ISBN 978-4478012031) is available from Amazon-Japan. They have a preview, so here's my translation of the prologue (I'll post the first chapter on Wednesday). In Japan, the "managers" (assistant coaches who tend to non-coaching duties) of high school sports teams are usually girls. This excerpt from Kokoyakyu, a very good documentary about high school baseball in Japan, briefly features the team's girl managers. What if the Girl Manager of a High School Baseball Team read Drucker's Management? Minami Kawashima became the manager of the school baseball team her junior year of high school. It was the middle of July, just before summer vacation. It happened quite out of the blue. Until practically the moment before, she'd been just another ordinary student, uninterested in any after-school activities, let alone baseball. Being the manager of a high school sports team was the furthest thing from her mind. Her junior year in high school--and days before summer vacation--was about the most least opportune time of the year to arrive at such a decision. But an unforeseen set of circumstances led her to make the plunge. Minami had only one goal in becoming manager. And that was taking the team to the Koushien National High School Baseball Championships. This wasn't a vague or fanciful dream. It wasn't a wish. It was a concrete objective. It was her mission in life. Minami didn't say, "I'd like to take the team to Koushien." She said, "I'm going to take the team to Koushien." Which was all fine and dandy. But the truth was, she didn't have the foggiest idea how to turn this conviction into reality. As has been noted, she'd had zero contact with the baseball team before then, and wasn't quite sure what being the manager even involved. But that didn't slow her down in the slightest. She naively assumed she'd figure it out along the way. Minami was the kind of girl who leapt before she looked. That was certainly her state of mind when she became manager. Before thinking, "How does one take a baseball team to Koushien?" she'd already resolved, "I will take this baseball team to Koushien." And having committed herself to that end, she did not pause to ponder. But turned directly to action. UPDATE: It's being made into an NHK anime series. "that taking was the team" should read "that was taking the team"
I assume that was a remnant of Japanese verb order? If a paranoid skitzo like Billy Martin can manage a major league team I suggest that ANYONE can manage a baseball team. And if the manager is a cute girl and the team is bunch of teenage boys I dare say that is going to be one motivated team!